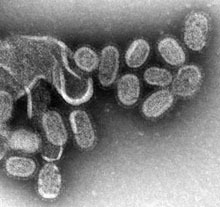 Influenza, commonly referred to as the flu, is an infectious disease caused by RNA viruses of the family Orthomyxoviridae (the influenza viruses, see figure 1), that affects birds and mammals. The most common symptoms of the disease are chills, fever, sore throat, muscle pains, severe headache, coughing, weakness/fatigue and general discomfort. Sore throat, fever and coughs are the most frequent symptoms. In more serious cases, influenza causes pneumonia, which can be fatal, particularly for the young and the elderly. Although it is often confused with other influenza-like illnesses, especially the common cold, influenza is a more severe disease than the common cold and is caused by a different type of virus. Influenza may produce nausea and vomiting, particularly in children, but these symptoms are more common in the unrelated gastroenteritis, which is sometimes called "stomach flu" or "24-hour flu". Figure 1. Electronic Microscope (EM) pictures of the influenza virus. Typically, influenza is transmitted through the air by coughs or sneezes, creating aerosols containing the virus (see video 1). Influenza can also be transmitted by direct contact with bird droppings or nasal secretions, or through contact with contaminated surfaces. Airborne aerosols have been thought to cause most infections, although which means of transmission is most important is not absolutely clear. Influenza viruses can be inactivated by sunlight, disinfectants and detergents. As the virus can be inactivated by soap, frequent hand washing reduces the risk of infection. Influenza spreads around the world in seasonal epidemics, resulting in the deaths of between 250,000 and 500,000 every year, up to millions in some pandemic years. On average 41,400 people died each year in the United States between 1979 and 2001 from influenza. In 2010 the CDC in the United States changed the way it reports the 30 year estimates for deaths. Now they are reported as a range from a low of about 3,300 deaths to a high of 49,000 per year. Three influenza pandemics occurred in the 20th century and killed tens of millions of people, with each of these pandemics being caused by the appearance of a new strain of the virus in humans. Often, these new strains appear when an existing flu virus spreads to humans from other animal species, or when an existing human strain picks up new genes from a virus that usually infects birds or pigs. An avian strain named H5N1 raised the concern of a new influenza pandemic, after it emerged in Asia in the 1990s, but it has not evolved to a form that spreads easily between people. 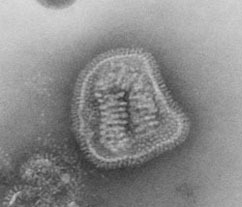 In April 2009 a novel flu strain evolved that combined genes from human, pig, and bird flu, initially dubbed "swine flu" and also known as influenza A/H1N1, emerged in Mexico, the United States, and several other nations. The World Health Organization officially declared the outbreak to be a pandemic on June 11, 2009. The WHO's declaration of a pandemic level 6 was an indication of spread, not severity, the strain actually having a lower mortality rate than common flu outbreaks. Vaccinations against influenza are usually given to people in developed countries and to farmed poultry. The most common human vaccine is the trivalent influenza vaccine (TIV) that contains purified and inactivated material from three viral strains. Typically, this vaccine includes material from two influenza A virus subtypes and one influenza B virus strain. The TIV carries no risk of transmitting the disease, and it has very low reactivity. A vaccine formulated for one year may be ineffective in the following year, since the influenza virus evolves rapidly, and new strains quickly replace the older ones. Antiviral drugs can be used to treat influenza, with neuraminidase inhibitors being particularly effective.